The onset of menopause comes about due to a decrease in estrogen and progesterone, the two major female hormones. The body's production of hormones drops dramatically alongside the aging process, and women's bodies can slow down their estrogen and progesterone production at an age as early as 30. Menopause officially occurs when a healthy woman, who is not pregnant, goes for 12 solid months without having a period. However, some menopausal symptoms can occur months or even years before its onset. This stage is referred to as perimenopause and can last for months or even years before commonly ending when a woman has her last period. If you're in the right age range and have a few of these symptoms, it's likely that you're going through perimenopause. Fortunately, there are ways to naturally ease these symptoms by addressing the core issue that causes them: hormone imbalance. Since all menopause symptoms are technically natural side effects of your body's decrease in hormone production, you can ease the symptoms by reaching right for that central cause. 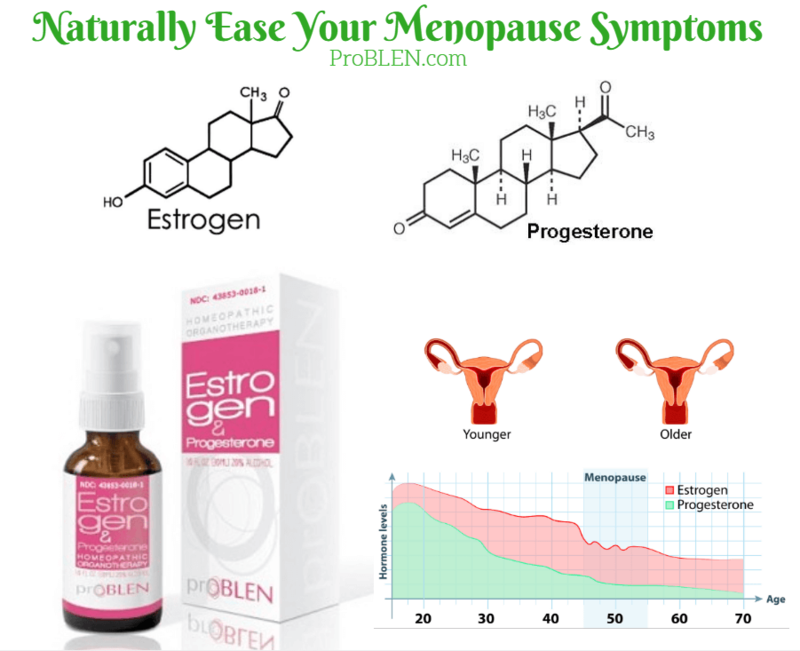 Natural, homeopathic estrogen and progesterone booster from ProBLEN will safely increase your body's production of these hormones, which will, in turn, reduce the symptoms caused by their imbalance. Mental, physical, and sexual symptoms of menopause are all affected and reduced in this way, and women who have experienced ProBLEN's Estrogen & Progesterone Formula report a positive result on all counts. If you're interested in trying ProBLEN hormone boosters but have concerns or questions, please contact us and we'll help you decide if our products are right for you and your quest for well-being and health at any age.